Father Paul Evard, a retired priest of the Archdiocese of Indianapolis, died on March 19 at Greenwood Meadows nursing home in Greenwood. He was 82. A visitation will take place from 9:30‑11 a.m. on March 23 at St. Barnabas Church, 8300 Rahke Road, in Indianapolis. The Mass of Christian Burial will be celebrated at 11 a.m. at St. Barnabas Church. Archbishop Charles C. Thompson will be the principal celebrant of the Mass. Father Gerald Kirkhoff, director of the archdiocesan Mission Office, will be the homilist. Burial will follow in the priests’ circle at Calvary Cemetery in Indianapolis. Ordained in 1961, Father Evard served for 32 years as a missionary in South America, primarily in the Diocese of Guayaquil, Ecuador, which became an archdiocese in 2009. He carried out this ministry for a period through the Missionary Society of St. James the Apostle, a Boston-based organization for diocesan priests serving as missionaries. Father Maura Rodas, a retired priest of the Archdiocese of Indianapolis who was born in Ecuador, recalled how Father Evard served in neighborhoods in Guayaquil marked by poverty, a lack of education and a poor knowledge and practice of the faith. Father Evard also started schools for the children of the neighborhoods, said Father Rodas, who once visited Father Evard in Ecuador on behalf of the Mission Office. At times, Father Evard was forced to return to the archdiocese because of health challenges, but Father Rodas said that his love for Ecuador led him back. Paul Anthony Evard was born on Sept. 27, 1935, in Indianapolis to Richard and Ruth Evard. He attended Shortridge and Cathedral high schools, both in Indianapolis, and for a year attended a school in San Jose, Costa Rica, when his father was working in the Central American country. Father Evard later became an archdiocesan seminarian and graduated from the former St. Mary’s High School Seminary in St. Mary’s, Ky. He was also a college seminarian at the former St. Mary’s College and received his final four years of priestly formation at Saint Meinrad Seminary and School of Theology in St. Meinrad. Father Evard was ordained a priest by Archbishop Paul C. Schulte on May 7, 1961, at the Archabbey Church of Our Lady of Einsiedeln in St. Meinrad. His first pastoral assignment was as associate pastor of St. Paul Parish in Tell City, where he served from 1961-62. He then ministered as associate pastor of St. Ambrose Parish in Seymour and the former Our Lady of Providence Parish in Brownstown from 1962-64, and at St. Malachy Parish in Brownsburg from 1964-65. In 1965, Father Evard was given permission to join the St. James Society and served in Peru until an illness forced his return to the archdiocese in 1967. He then served as associate pastor of the former Holy Guardian Angels Parish in Cedar Grove until 1968, when he began service in the Diocese of Guayaquil. Father Evard returned to the archdiocese in late 1971, serving as associate pastor of St. Joseph Parish in Shelbyville for three months and associate pastor of the former St. Andrew Parish in Richmond until August 1972. He then returned to the Diocese of Guayaquil, serving in it until 1980. 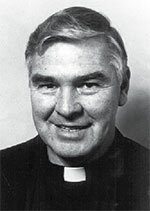 From 1980-81, Father Evard ministered as the pastor of St. Michael Parish in Charlestown. In 1981, he returned to the Diocese of Guayaquil and remained there until 1997. From September 1997 until January 1998, Father Evard ministered as the pastor of the former St. Leonard of Port Maurice Parish in West Terre Haute. He returned a final time to the Diocese of Guayaquil in 1998, and remained there until 2001 when he retired and returned to live in the archdiocese. Surviving are two sisters: Benedictine Sister Virginia Evard of Winnipeg, Canada, and Dolores Kesterson of Noblesville, Ind. ; and a brother, Joe Evard of Cleveland.